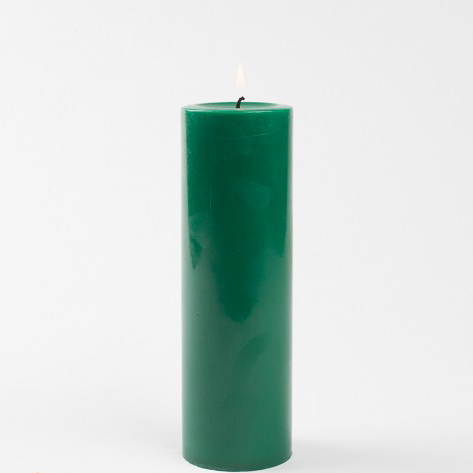 Dark Green Pillar Candle, 3 inch by 9 inch, Unscented, Hand Poured, and colored through out, burns for approximately 120-160 hours. This is a classic, smooth sided pillar candle. It measures 2-7/8 inches in diameter and is 9 inches high. Individually hand-poured, never a cheap color over-dipped candle. Perfect for wedding candles, restaurant candles, for reception table or any event. The bold and solid beauty of these pillar candles will add color to your home, business, or special event. Versatile pillar candles can stand alone or in a grouping for simple sophistication. Our pillars are made with the finest solid color wax throughout the candle so you can enjoy their outstanding quality each time you burn them. Our extensive pillar selection offers variety in size and color for the perfect addition to any decor. Our 3"x9" pillar candle features a sophisticated smooth finish. Don't forget the Pillar Holders!